The crown jewel of Joe Vicari’s empire, featuring Italian steakhouse fare. : Based on the family-style steakhouses found in Tuscany, Andiamo is now known as Joe Vicari’s Andiamo Italian Steakhouse. 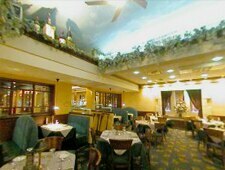 It retains the dedication to quality food and service that has made the restaurant a good place for fine Italian cuisine. Hand-cut steaks, aged 30 days or more, are served with a choice of sauces, among them Cabernet shallot demi-glace and balsamic glaze with cipollini onions. Consider, too, the cuts of lamb and veal dishes like veal alla trattoria (veal scaloppine with long stem artichokes, shiitake mushrooms and capers in a lemon Chablis sauce) and the char-grilled veal rib-eye steak topped with portobello mushroom slaw on a bed of balsamic-braised Swiss chard. Wine selections are listed progressively within their categories, starting with lighter bodied and fruit-forward wines and extending to those that tend to be fuller bodied and more complex. There are also numerous wines available by the glass. Don't want to dine in? In a hurry? Consider the carry-out dinner for four, available daily until 7 p.m.